Now that we've gotten up close and personal with my reproductive organs, I thought I should write a more typical for this place kind of blog post. After the clinic this morning, my mom suggested we go thrifting. We haven't gone together since before the school year started (we're both teachers) and she missed it..awwwwww! I've officially spread my thrifting addiction to my mother. I can't say I feel too badly though because I always find the best stuff when I'm with her. The lady is like thrifting magic! Plus we get to spend some time together. We hit up six thrift stores, although it wasn't as crazy as it sounds since three were in one plaza and the other three in another. 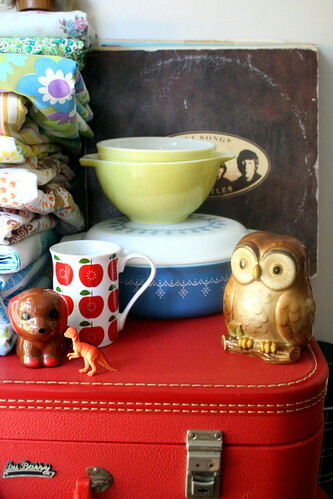 There were a lot of great finds, including some Pyrex! We also found several amazing children's books to use in the classroom, most of them never even cracked. I got a fall coat (just have to sew on some buttons), and my mom got a much needed paper tray since hers is flimsy and falling apart. We're still deciding who gets to keep the apple mug! 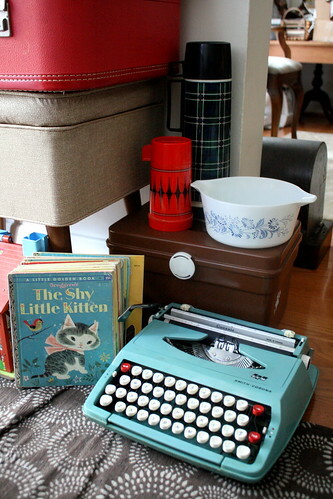 Several times now I have thrifted something I really liked and then for some reason or another - mostly space issues or a random cleaning spree - decided to part with it. Most of the time I don't end up missing it, but occasionally I do. 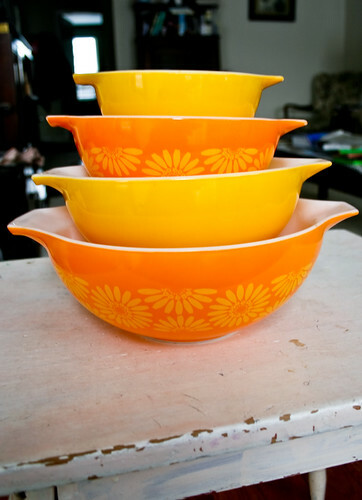 The worst case of this was when I sold my yellow daisy cinderella bowls because I wasn't crazy about the pattern, and a few weeks later completely fell in love with it. I did get another set after a few months of searching. 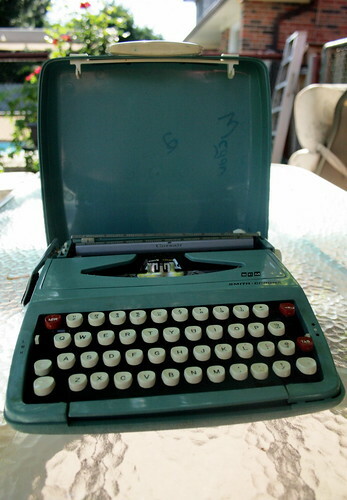 Today I was able to replace two of those 'regretted give-away' items - a vintage floral sheet, and this turquoise typewriter. The original had a top to the case with adorable writing by a 6 year old named Megan, but this one works much better with no sticky keys! The brown sewing box is the same as a cream coloured one I found a few weeks ago. 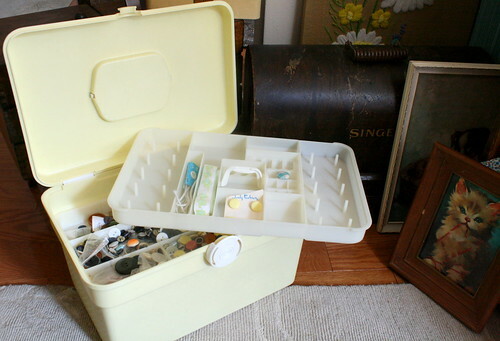 I absolutely love these for storage because of their size and the trays they have. So useful for so much more than sewing supplies! The Little Golden Books are from the 60s and 70s, except for the Shy Little Kitten which is from 1946. Unlike the books mentioned above, these will not be going into the classroom. I have a little stash of 'one day' books and these are going right in there. I love the soft illustrations. 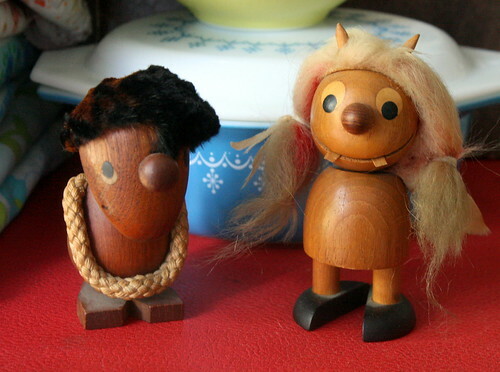 These mid-century teak figures are too cute. 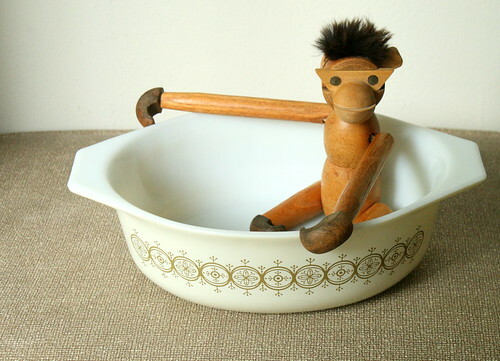 They caught my mom's eye, and reminded me of the teak monkey we found. The one on the left was made in Denmark, but the one on the right has no markings that I can see. 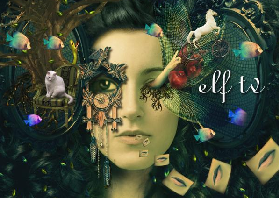 She does remind me a lot of the characters from Where the Wild Things Are..
A few posts back I mentioned Bar Keeper's Friend (we use the Soft Cleanser), and I am going to continue to declare my love for this stuff. 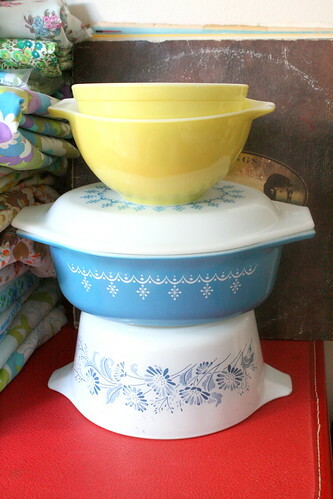 We picked up two little yellow Pyrex bowls today that were completely scratched and looked to be in horrible shape. We found them at a store that never has any Pyrex because the antique dealers always hit it up first due to the low prices, and we both thought the only reason they were there was because of the condition they were in. My mom convinced me to risk it, hoping we could clean them up a bit, and wow did we ever! They are both in almost mint condition after a cleaning with the stuff. I think Lucy would be proud of me for "saving" them. I still have to use it on the Colonial Mist casserole dish, but I imagine the marks will come right off. I should mention that the marks I'm talking about are silver cutlery marks. They look like silver scratches kind of like pencil marks, and they were all over the outside of these bowls. The cleaner also seems to work pretty well on grease. What it won't help - white scratches that are actually chips in the paint, and burn marks. 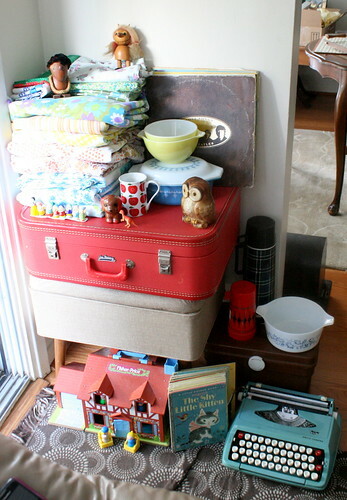 Some other finds from today: red suitcase, a few records including Raffi's Singable Songs (one of my favourite albums for kids) and the Beatles' Love Songs album, a Fisher-Price tudor house which was only really bought for the furniture inside, a couple neat thermoses, vintage sheets (oh, my! 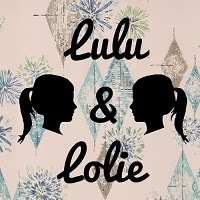 ), a ceramic owl bank (overpriced, so this was a splurge, but I just love it), a couple figurines including a set of Snow White & the Seven Dwarves, and some adorable little frilly dresses that will end up in Lolie Jane Vintage some time soon. The dinosaur came in the bag with the Snow Whites and it just seemed fun. I have a few others hanging around from random packages I've received. Hopefully we will do this again soon, or even better, visit all the craft fairs and church bazaars that will be starting in early October! I don't know if you were referring to me, but, I am proud of you for cleaning up those bowls! I would have done the same! What amazing finds! 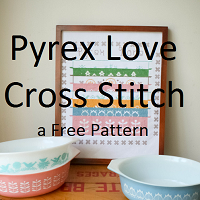 I love all the pyrex, and I'm pretty sure I have some childrens books by the same company, only in French! xo.